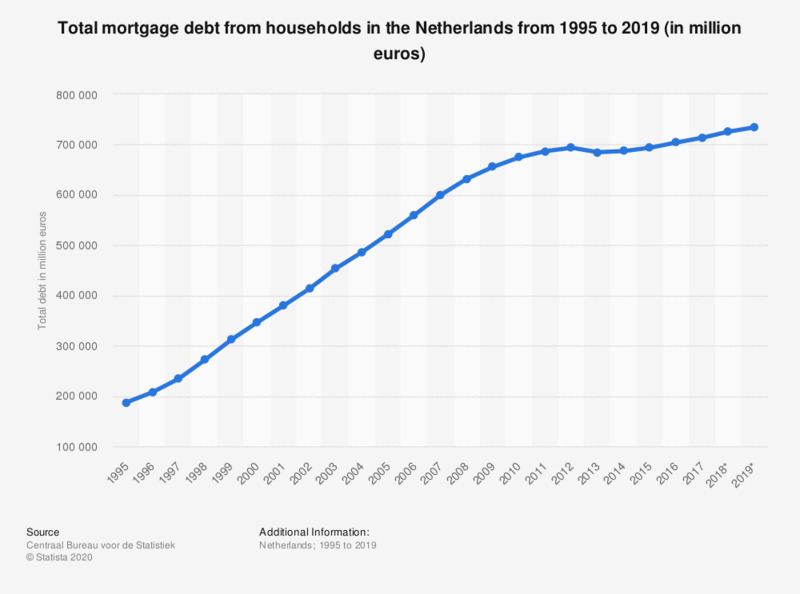 This statistic shows the total mortgage debt from households in the Netherlands from 1995 to 2017 (in million euros). In 2017, the total debt reached a value of approximately 672 billion euros. Within Europe, the Netherlands counts as one of the countries with the highest mortgage debt among private individuals. This has a political background as the Dutch tax system allowed homeowners for many years to deduct interest paid on mortgage from pre-tax income for a maximum period of thirty years, essentially allowing for income support for homeowners. In the Netherlands, this system is known as hypotheekrenteaftrek. Since 2014, the Dutch government is slowly scaling this down, with an acceleration planned from 2020 onwards. In the third quarter of 2018, the market share of mortgage turnover in the Netherlands reached approximately 52 percent for the three banks ABN Amro, Rabobank and ING. The European housing, or residential real estate, market has recently shown clear signs of recovery, with an increasing house price being the main trend. In recent years, the housing market has continued to rise in the Netherlands due the asset purchase programme (APP) of the European Central Bank and the, consequently, low mortgage rates. For example, the number of registered transactions reached a value of approximately 242,000 in 2017. The value of mortgages in 2019 is forecasted to increase with approximately 3.2 percent compared to 2016. * The numbers provided for 2015 to 2017 are provisional.